I''ve gotten many compliments on this watch. The craftsmanship is phenomenal and the watch is simply pleasing to the eye. My only complaint is it seems a little fast, just slightly, so I find myself winding it back a few minutes every month or so. 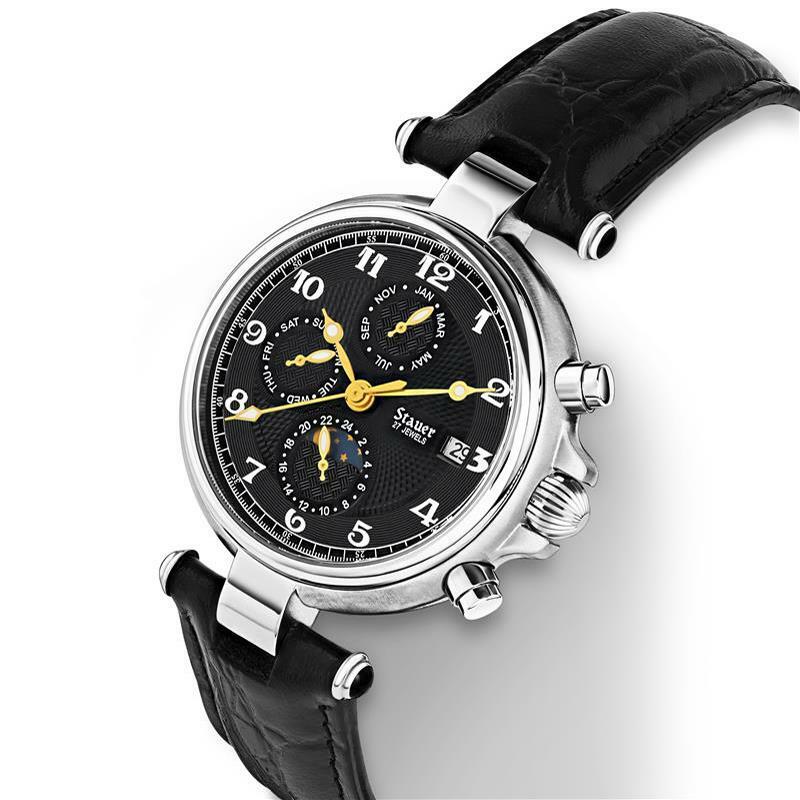 Otherwise, I''m thoroughly pleased and will be ordering another Stauer watch soon. Black on Black with a sophisticated shine! A gorgeous watch with a classic retro look. Mine keeps great time, and I get complements on it all the time. GET THIS WATCH. You could always pay more and get a lot less from other watch makers. Stauer is the only watch brand for me. This watch looks and feels 5 times the price of what I paid. From the rich feel and smell of the leather band to the quality of craftsmanship of the watch itself. I get a LOT of compliments. The only thing is I don''t wear it everyday (got it as a dress watch and fear of scratching/scuffing it with everyday use) so I need to wind and set it when I do, however thats not a complaint, just an observation. I have had this watch for 19 months and it keeps great time I get lots of complimentson this watch. I love it. I can be pretty hard on watches but this one has held up great I wear it every day all day. I will be buying another one if this one ever breaks. I should have paid MUCH more for this watch! I received this watch today after only 3 days and was floored when I opened the case. The watch band is gorgeous (albeit a bit stiff at first), and the watch face looks even better. My favorite aspect of this watch has to be the fact that the sun/moon dial actually changes with the hour! There is not enough space or time to fully articulate my love for this timepiece, and if this watch goes out I will definitely buy another one. This watch is well worth every cent I paid for it. The box it arrived in was wrapped in leather as well and should have cost $100 by itself. 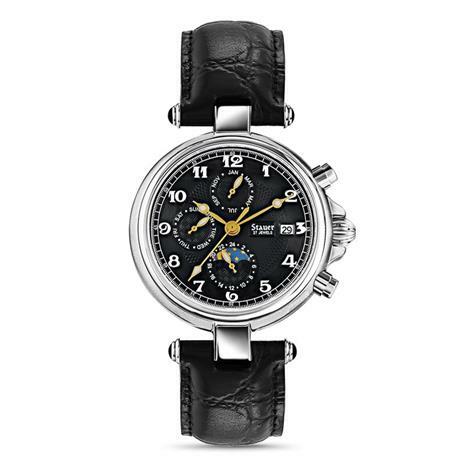 If you are in the market for a watch, this one is it. I have had this watch for 14 months, it keeps great time and looks great, lots or compliments. Goes well with a suite or jeans and t-shirt, looks and feel better than some of my more expensive watches. I strongly recommend it! I love my Stauer Noire watch and wear it almost every single day. The only complaint I have is that it is a little fast and I find myself readjusting the time every week (about 2-3 minutes). Other than that, an excellent product that I wholeheartedly recommend! A fantastic watch, that has a great &quot;grandeur&quot;. Everybody thinks that it is a very expensive watch. It has a nice design. My personal only complaint is that I live in the Netherlands and can''t buy directly. Lucky for me my son lives in Texas and that he orders it for me. I pick it up when we go on vacation by him.In the meantime I have bought two other watches from Stauer.Unfortunately the next vacatiopn is in september 2009, so I have to wait untill then to wear them. Just got my black Noire yesterday from my leder brother. It''s simply pretty..and really smooth. It compliments..most of my outfits..and i don''t have to scratch my head when wondering what time piece to wear.I recommend this watch to anyoine who is looking to get a smooth and matured time peice. This is the most impressive and beautiful watch I have ever seen. The catalogue photo is a very inadequate image of the real thing. The only thing that worries me is the need to set the watch back a couple of minutes every week because it runs a bit fast. This would be no problem if it were not that the spring-loaded crown and stem will wear out sooner because of this. The back of the watch can be opened for adjusting the speed but only with a special tool. The first one I received was defective and the return service was EXCELLENT. I love this watch. I work in retail and Stauer sets an excellent example of how a company should do business. I will purchase from then again and recommend them to others. The second watch sent me keeps perfect time. The catalogue photo has been greatly improved. Now there is nothing to complain about this very attractive watch. The people at Stauer are helpful and obliging. They do what they say they will do. the prettiest watch you will ever see. It works great.I have both colors because i couldn''t decide which one to get. Than the most wonderfull thing happen they went on sale. I have only one complaint about this watch. It''s a little thick for me. But I have small wrists. If Stauer listed the thickness of their watches I may have not bought this item. I''m still glad I did though. When I wear it I get compliments often. And it keeps very good time. I took the back off once. It''s no Rolex, but the inner workings look to be good quality. Pictures can not show the true beauty of this watch. You have to see tis watch, particularly in sunlight where nit literally comes to life. Its a real attention getter just like the gold Vendage. In appearance they rank right along with Rolex and Omega. You can''t go wrong with this watch. I use it with a stainless bracelet which makes it even more noticeable. Buy It!!! great watch, It''s look like $1000 more watch.My friend told me that. I love this thing but the strap is to hard. ...This is my second Stauer...I was attracted to it because it channels my first Stauer..the Graves...the Noire is very distinctive in black...It certainly makes a statement and performs perfectly...Stauer knows how to make an attractive and unique wrist watch...my collection continues to grow! I love this watch! I''ve gotten plenty on compliments on it. It goes great with a black suit. Black on black. If your thinking about...JUST GE IT! you wont regret it. Absolutely amazing. My coworkers was jealous seeing me wearing it everyday. They thought it must be some expensive brand from Swiss, and were surprised by the Chinese workmanship on this watch. I even got compliments from the banker teller when I put my hand on the counter siging the bank slips. This is both a stylish and practical watch. I''ve worn it for every day business and Black Tie Formal and it fits in for all occasions. I received it as an anniversary present over a year ago and so far no problems with the watch itslef. The only issue I have is that the leather finish on the strap is starting to wear out due to constant use. Is This A $100 Watch? I just got my Noire today and its amazing!!! It has great detail and it goes with everything I wear.It is very smooth when put on and I just love the color of the face! I would recommend this watch to anyone who wants a watch that is elegant and durable .......GET ONE!!! I am one of those people you''ve heard of that can''t wear a watch because it stops after it makes contact with skin. I won''t return the watch though because it works perfectly on everyones'' wrist but mine! This is a weird phenomena that happens with Rolex, Bruget, TAG Heuer you name it. I put on a $12,000 Rolex president in a local high end jewelry store owned by a friend it stopped dead in about 40 seconds! He bet me Lunch for life it was a trick. I put on every watch in his store and the same thing happened. Cedar plank Salmon and rice today.....I carry the skeleton pocket watch without mishap.Also an exquisite timepiece for $75! I am a woman who likes large watches and the features that men''s watches have that many women''s watches are missing. This watch is not only well designed, the photo hardly does it justice. The face is more detailed and is amazing for the price. The only thing I had to do since my wrist is thin, was to have my shoemaker take an inch off the band to fit me. Other than that, fantastic value, fantastic watch! One of my favorites. Nicely designed, attractive timepiece with a truly unique look and a good-quality band. Can''t go wrong with this classy automatic! Wow, what a great time piece. For the price, it can''t be beat. Easily worth 5x the asking. Great fit and finish. Automatic movement moves so smooth. Very good job by Stauer!!!! A great watch! I''ve had this watch for 2 years now and I love it just as much as I did the day I received it! !As someone did mention it does get a little ahead of time. Once a month or so I do have to set the watch back 2-5 minutes, but it''s truely no big deal! A small price to pay for such a great watch! I recently purchased from Stauer the stainless steel Noire watch. After wearing the watch for about a week I noticed that it consistently ran 13 seconds slow. I decide to have the watch regulated. Afterwards wearing the watch continuously 24/7 for one week. The watch will run consistently, between one and two seconds fast on a daily basis no more than that! I have never had a mechanical watch this accurate to say the least I am very impressed! I will be a repeat customer. I''ve always wanted to try a Stauer, and I wish I would have made the jump earlier. The watch is hefty, it''s brimming with little details, like the black stones where the band attatches or the contrast of polished and brushed steels used for the case. So far it keeps perfect time and is one of the most amazing things I''ve ever owned. Consider me a fan for life. I bought a used desk and this watch and was inside. I was so surprised right away how fancy it looked. I like more rugged looking watches, but this one turned me into a classy gentleman. I like to golf alot at nice resorts, this watch will compliment my golf attire and hopefuly a few golf strokes!! I sure do appreciate a well made watch. We are in our own class of society. I bought this watch about a year ago and it has never failed me. It''s beautiful when worn formally or just a casual dinner with friends. A collector asked me how much I paid and when I told him, he said it looked like I spent over $1,000.00 on it. I agree. I started my collection with this watch and, while my collection is still small, many more Stauer watches are in my future!! The only problem I have is choosing which one to get next!!! Keep making great timepieces that are affordable to purchase for starters!! The Stauer watches will definitely be passed down to my children and I have no doubt they will last until after I''m gone. Great job!! You''ve earned a customer for life. I never saw myself as a collector of watches but when I met the noir, I had to make the buy. I love the unique look for the numbers, multiple complications and the rich texture of the face. Frankly there is nothing a real automatic watch. No battery power for me. If it does not have a real tick it is not worth the money. Three purchases from Stauer and three wins, the Sauer 1779 Skeleton watch in gold, the raw emerald necklace for a friend and now the Stainless Steal Noir. The Noire Watch is very stylish, but very subtle. The overall benefit is also that it is terribly functional. Great buy, Great price, Great time! I already own a Skeleton by Stauer and can''t say enough to express my pleasure with the watch. Just from the photo and discription of the Noire I believe I''ll soon have a second Stauer watch to pass down to my my 6yr. old son someday. I''ve had my Noir for a couple of weeks now and can''t stop lookimg at it. The date window is a little small for my 40 year old eyes to see clearly, but I don''t care. I can rememeber what day it is. Wearing this watch is wearing art. This is a nice watch and keeps very good time. For the money it is very good. However it is advertised as a 27 jewel watch but the movement says 21 jewels right on it. Also the date window is a little hard to read. This is my fist purchase from Stauer. I bought this watch and then also decided to get the Graves watch too, since I had seen it in magazines for years. I have been intrigued by the Stauer watches that I had seen, so I decided to take the plunge.I wear the Noire Watch every day and find it very functional. The one I have does gain a couple of minutes a week, but other than that, it is excellent. I don''t expect quartz accuracy with a mechanical watch anyway. I want to get away from having to keep going to a jeweler to get a new battery put in. It''s a nuisance. The automatic kind is more my speed, even if less accurate. I am sure that there will be other watch purchases from Stauer in the future. A gorgeous watch with a classic look. I get complements all the time. A fine addition to my over 30 watch collection.Only complaint is with the date settings. These buttons do not deactivate when the crown is pressed in in &quot;lock&quot; mode, causing inadvertent date changes if buttons press against the top of your hand.I still highly recommend it. Got this watch to wear with the black clothing I like to wear doing security. Purchased the gold version for my son. My only problem with the watch is it is almost impossable to read the date complication unless the lighting is just right. It rarely is. The 24hr complication would be more usefull if it could be independently set. That way you could set it to the time at home when in Europe or Asia so you don''t call the wife in the middle of he night! Otherwise, GREAT!! Remember, this is a wonderful machine. If you want to have your watch right on without seting it, get even a cheap quartz watch will do better. I like wearing a bit of history on my wrist, and can set it online at time.gov. I only have three things that I would call complaints. First, it is not as accurate as I would like. It runs kind of fast and has to be backed up 3-5 minutes every week.Second, the band hasn''t worn very well. I have quite a few places where the shiny black has come off and it is now a flat black underneath.Third, I find that I bump the buttons on the right hand side a lot so that the accessory dials on the face are rarely correct.Other than that, very happy. From the day that I bought this watch till now all I can say is &quot;Wow!&quot; the quality and build was just completely unexpected! I was also surprised to find that the entire case is just completely solid. The nice sized Gold hands also make a nice addition to the watch. As accuracy goes all I can say is that it is amazing. I would deffinitly would recomend to people. Thanks Stauer!!!!!!! This is the first watch I have purchased from Stauer, and I did so only because all the other reviews looked so good. I now agree. It is very cheap, and although that is justified by its'' nationality''s reputation, the actual quality is not relative... basically, from the outside, it almost seems like one of the bigger luxury timepieces. And I can''t say much more than it looks great. Black goes well with everything, and it has just the right number of complications. My only complaint so far is that the band is a bit stiff at first, but I will break it in soon I''m sure. It only seems more quality that way. I haven''t had it for long, so I don''t know how long it will last, but I''m keeping my fingers crossed. Having had this watch now for over two years, I can attest to the fact that it draws no end of compliments and &quot;Where did you get that great watch?&quot; questions. It keeps excellent time.I wear it with black, with grey, and with blue. I wear my Stauer Graves with brown, khaki, black and green. I also have a Stauer rose gold. You can see I am a Stauer fan. I haven''t even mentioned all the jewelry I have bought from Stauer for my sweetie. I have had this watch for 4 years now and it still keeps perfect time and has held up to wearing every day, what a great watch. My band has finally died and you have to order these from Stauer. I have just bought a hybrid watch and will wright a reveiw on that one when I get it. Stauer has great quality for the money. My Noire just arrived, and it is a beautiful watch. It was easy to set the time and date, and the second hand movement is nearly a sweeping motion, indicative of high-quality mechanics. The detail on the watch face is mesmerizing. Consistent with other the reviews, the band is very stiff, but if you want an authentic replica, that''s what you get. I was surprised and a little disappointed that the movement was Chinese-made. I wasn''t expecting a Swiss movement at this price range, but that would explain the good deal. I''ve had this watch for three months now. I get compliments on it all the time. Only complaint is that the face is so &quot;busy&quot; that if the light isn''t hitting it right it can be hard to find the hands to tell the time. Other times, its a breeze. Wow, just got this in the other day. I am very pleased. Such a beautiful watch for the price! I love the automatic movement and this one does not disappoint. Will be purchasing several more watches and other gifts for myself and friends.Thanks Stauer for making great looking watches at a great price. Lots of compliments from friends and strangers about its design of a antique watch. I have had this for over 3 yrs now and it still looks great. Yet the leather band begins to wear out, and the day pointer is off the center of the current day, a minor blemish that I can still put up with it. I have had this watch for over 3 years now. It''s durable, keeps great time, and still looks new. The looks of the watch speak for itself. Just beautiful! I am in my early 30''s and I wear a suit every day to work. This watch goes with them all. My only compliant on the watch is the size. Even though it looks great on me, I am about 6''3&quot; and about the size of a linebacker. So the watch is small to begin with it just looks smaller on me. With all that being said it is still the first watch I reach for every time I dress formal. Comfortable and accurate with perfect engineering. I''ve been wearing this watch daily since purchasing and can only think of one word, &quot;outstanding.&quot; I recently decided to purchase its twin...the Stauer 22K Gold Fused Noire Watch to complete my set. &quot;Thanks&quot; Stauer for excellent customer service and amazing shipping and delivery. Great watch, I always feel like a million bucks when I wear it. Classic look and I've gotten compliments on it. I bought a Noire watch nine years ago. Soon after my wife gifted me with a watch, so I put the Noire away and occasionally admired it. It sat in its case for nine years. Recently I decided to wear it once a week. I put it on and set the time, day, and date. It immediately began working and kept perfect time that first day and has continued to since. (it's been a few months now). I'm really happy with the quality, reliability, and craftsmanship. 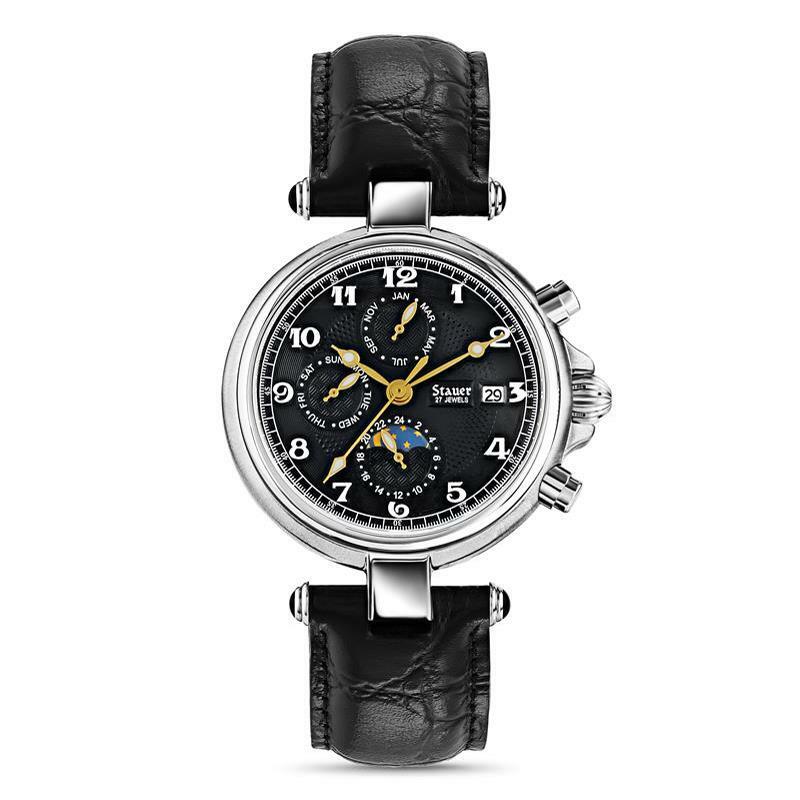 The Noire was my very first watch from Stauer. I ordered it in 2008, and love it today as I did 10 years ago. It has taken several lickings but continues to tick. Owning the Stauer Noire Black Men's Watch is without a doubt owning more for less. Elegance and precision for all occasions! The Stauer Noire watch is simply amazing! Over the years I’ve collected many watches. Work has taken me from the military to the Hollywood Hills and everywhere in between, so I have a watch for almost any situation, however - I have three distinct favorites - an Omega Seamaster, a classic Hamilton chronograph, and my Stauer Noire. Of the three, I believe the Stauer Noire has gotten me more compliments than ANY I own! From weddings (my own included! ), to funerals, even to the Grammy Awards, it is elegant without being too “flashy” and perfect for everyday wear. The workmanship on the Noire is outstanding, and the precision is equal to any watch I own, including ones costing THOUSANDS OF DOLLARS! Thank you Stauer for such a beautiful and solid timepiece, I am happy to tell anyone who asks about it (and they do!) and I love the look of surprise on the faces of the few I let in on the price I paid for it! I've had the black noire for over 15 years and for all those years I've never had any serious issues with this time piece. A well made watch. Very reliable and highly durable. I purchased the Stauer Noire and a Tanzanite ring and matching ear rings. Both arrived within four days in perfect condition. The watch looks better in person than the photos depict and so does the ring. I read the instructions and started and set the watch and it has run perfectly for two weeks. it is never more than 5 seconds slow per day. I have put it in my watch box with a full wind and it has run for the last 41 hours without a wind or being moved and stayed withing -5 seconds per day. All of the sub dials for day, month, date and hour of the day with sun and moon dial have performed flawlessly. The watch is very comfortable to wear and looks very nice.I paid $99 and it is easily worth the regular $149. this is my second Stauer watch, I have a compendium Hybrid I got 6 years ago and it is still working perfectly on one battery change at the 3 year point. My Wife loves the tanzanite Ring and ear rings and wears them all the time. I will definitely purchase from Stauer again. In the early 1930's watch manufacturers took a clue from Henry Ford's favorite quote concerning his automobiles, "You can have any color as long as it is black." Black dialed watches became the rage especially with pilots and race drivers. Of course, since the black dial went well with a black tuxedo, the adventurer's black dial watch easily moved from the airplane hangar to dancing at the nightclub. Now, Stauer brings back the "Noire", a design based on an elegant timepiece built in 1936. Black dialed, complex automatics from the 1930's have recently hit new heights at auction. One was sold for in excess of $600,000. We thought that you might like to have an affordable version that will be much more accurate than the original. Basic black with a twist. Not only are the dial, hands and face vintage, but we used a 27-jeweled automatic movement. This is the kind of engineering desired by fine watch collectors worldwide. But since we design this classic movement on state of the art computer-controlled Swiss built machines, the accuracy is excellent. Three interior complications display day, month and date. The crocodile embossed leather band is adjustable from 6-1/2" to 9", fitting almost any wrist. The watch is also water resistant to 5 atm. We have priced the luxurious Stauer Noire to keep you in the black... so slip into the back of your black limousine, savor some rich tasting black coffee and look at your wrist knowing that you have some great time on your hands.